Tsehai Loves Learning-Healthy Whiz Kids Project, funded by US AID, transformed into big ideas that can help build a productive generation. One of those ideas was to hold a children’s festival. The children’s festival is a program that gives the appropriate platform to parents and children to learn about health issues in a fun way! Tsehai Loves Learning – Healthy Whiz Kids Children’s Festival was held on July 9th,2017 at Addis Raey Primary School aiming to improve the parents’ and children’s positive attitude and knowledge regarding health. During the festival, education and entertainment were uniquely combined to give children lifelong lessons regarding different facets of health. This festival consisted of art work depicting proper sanitation, hand washing, reading and also featured encouraging and engaging stories that focus on health issues as well as other activities for children from four years old up to early teens.The project, funded by US AID, focused on building a generation that has well rounded qualities. First off, the children’s festival can serve as an appropriate area of recreation where children can refresh their minds. Secondly, it helps children find themselves and express their talents. Lastly, the festival helps children and their parents to know about the most important part of their lives:health. The children had great time and actively participated in different educational programs with their parents. Around 1000 children with their parents attended the festival. The audience’s feedback was extremely positive and gave energy to implement the project into different areas at large. Based on the feedback of the parents from the festival, children’s festival is nothing less than a wonderland for children and their parents. Thus, Whiz Kids will continue holding children’s festivals at different places in Addis Ababa and Bahir Dar region. Great Work! JW, and educator and engineer, from USA living in Qatar, and would like to connect. Please forgiven me but I had a correction. 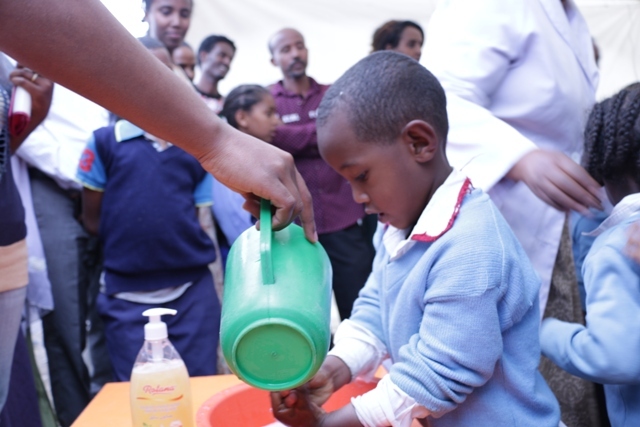 Just a comment on the spelling used in the photo of washing hands: “Tsehai Loves Learning- Healthy Whiz Kids festival thought me. I’m sure this is a typo – thought, I think it should be taught.